From route 25 in Moultonborough take route 171 South. Park at the Moultonborough / Tuftonboro town line. From parking at the Moultonboro / Tuftonboro town line I ascended the winding and moderately steep Bald Knob Trail following cairns and white blazes 0.95 Miles. The Bald Knob Trail had a few small patches of ice but easily bare-bootable. 1801 Ft. Bald Knob was originally a Carriage turnaround point and (with a little imagination) you can visualize offered impressive views to the South of Lake Winnipesaukee and the Belknap Range including Belknap Mtn. and Gunstock Ski area. From Bald Knob I bushwhacked North straight up to 2203 Ft. Turtleback Mtn. and enjoyed the views from the open summit. in 1958 Turtleback Mtn. contained an observation tower for UFO sightings and the steel cables and mounting hardware are still on the mountain. You'll still have great views to the South. Looking to the Northeast Shaw Mtn. and Black Snout stand in the foreground from the open summit. Instead of returning the way I came, I bushwhacked 0.15 miles North to the Turtleback Mtn. Trail. I followed the wide carriage road East along the contour line of Middle Mountain for 1.75 Miles. At the 2nd stream crossing the Turtleback Mtn. Trail switchbacks and begins it's approximately 1.5 Mile ascent to Black Snout Mtn. Instead of making the turn I bushwhacked straight maintaining elevation along the contour line approximately 0.2 miles to the Mt. Shaw Trail. The Trail ascends steeply 0.2 miles to the Black Snout Trail and gradually ascends 0.23 Miles to a junction with the Gorilla Trail and Thunderbird Trail then makes a final 0.19 mile pitch to the 2803 Ft. Black Snout Summit. Descend the Black Snout Trail to the Gorilla Trail junction and head North to Mt. Shaw. The first 0.2 miles are a moderate incline to a series of switchbacks that continue 0.2 miles to the Mt. Shaw Summit. At 2990 Ft, Mt. 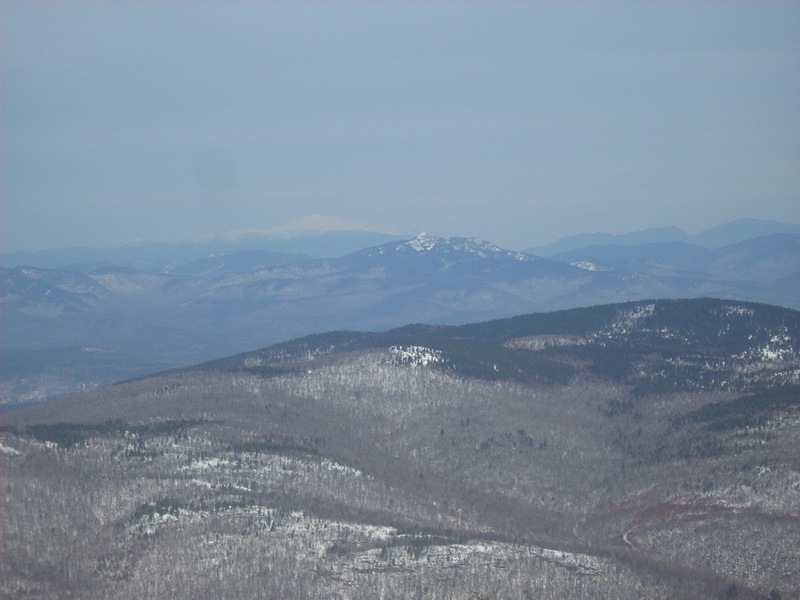 Shaw is the highest peak in the region and provides spectacular panoramic views of the surrounding Ossipee Range, Belknap Range to the South, Mt. Chocoura and the White Mountains to the North and Northeast. 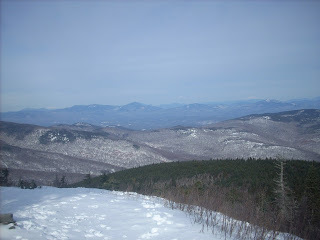 I descended gradually 1.1 miles via the High Ridge Trail marked with blue blazes to a saddle between Mt. Shaw and a 2601 Ft. peak. 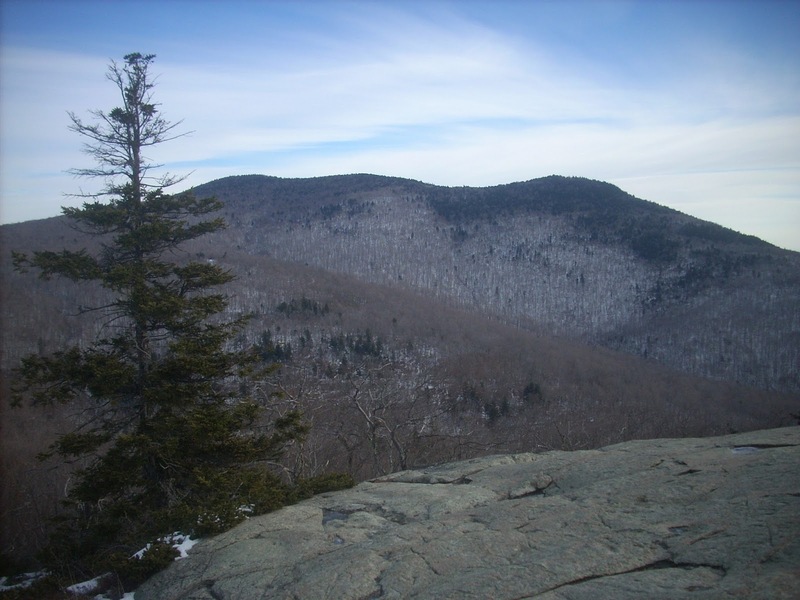 The High Ridge Trail follows it's blue blazes West gaining and dropping elevation for 0.63 Miles to the Upper Oak Ridge Cutoff blazed in white where it descends steeply 0.47 miles to the Upper Bridle Path junction. Continue 0.52 Miles following the white blazes on the Lower Oak Ridge Cutoff to a trail junction marked with orange blazes. Follow the orange blazes 0.34 miles south meeting trail junction and a short 0.13 miles later meeting another trail junction and 0.06 miles later a third trail junction. This brings you to the Shannon Brook Trail (snowmobile corridor) which descended to route 171. A short road walk will lead you back to the town line. Bald Knob Trail - Bald Knob = 0.95 Mi. 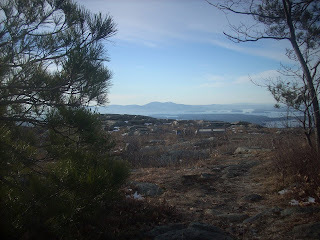 Bald Knob - Bushwhack to Turtleback = 0.42 Mi. Turtleback Bushwhack to Turtleback Mtn. Trail = 0.15 Mi. Turtleback Mtn. Trail = 2nd stream crossing switchback = 1.75 Mi. Bushwhack - Mt. Shaw Trail = 0.2 Mi. Mt. Shaw Trail - Black Snout Trail = 0.2 Mi. Black Snout Trail - Black Snout Spur = 0.23 Mi. Black Snout Spur - Black Snout Mtn. = 0.19 Mi. Black Snout Mtn. - Black Snout Spur Jct. = 0.19 Mi. Banana Trail - High Ridge Jct. = 0.4 Mi. Banana Trail - Mt. Shaw Summit = 0.41 Mi. Banana Trail - High Ridge Jct. = 0.41 Mi. High Ridge Trail - Trail Junction = 0.68 Mi. High Ridge Trail - Upper Oak Ridge Cutoff = 0.63 Mi. Upper Oak Ridge Cutoff - Lower Oak Ridge Cutoff = 0.47 Mi. Lower Oak Ridge Cutoff - Orange Trail Jct. = 0.52 Mi. Orange Trail - Junction 1 = 0.34 Mi. Orange Trail Jct. 1 - Orange Trail Jct. 2 = 0.13 Mi. Orange Trail Jct. 2 - Shannon Brook Trail = 0.06 Mi. Shannon Brook Trail - Route 171 = ~2.0 Miles. It was a beautifully clear day with 14 degree starting temperatures and the Ossipee Mountains were the perfect place to exercise my legs. My goal of the day was Bald Knob with the possibility of continuing on to Turtleback Mtn. I didn't expect a full 12 mile adventure but enjoyed every minute of it. Bald Knob offered great views of Belknap Mtn. and Gunstock Mtn. to the South. The clear winter views from Bald knob were impressive. Snow appeared at approximately the Bald Knob summit but only about an inch of hard crusty stuff. Still nothing substantial. The views were even more impressive as I continued North to Turtleback. There are 3 metal rods embedded into the granite rocks along with steel cable and other debris marking the remains of the 1950's UFO observation tower. I wasn't ready to head back down and the higher peaks of Black Snout Mtn. and Mt. Shaw were calling my name. 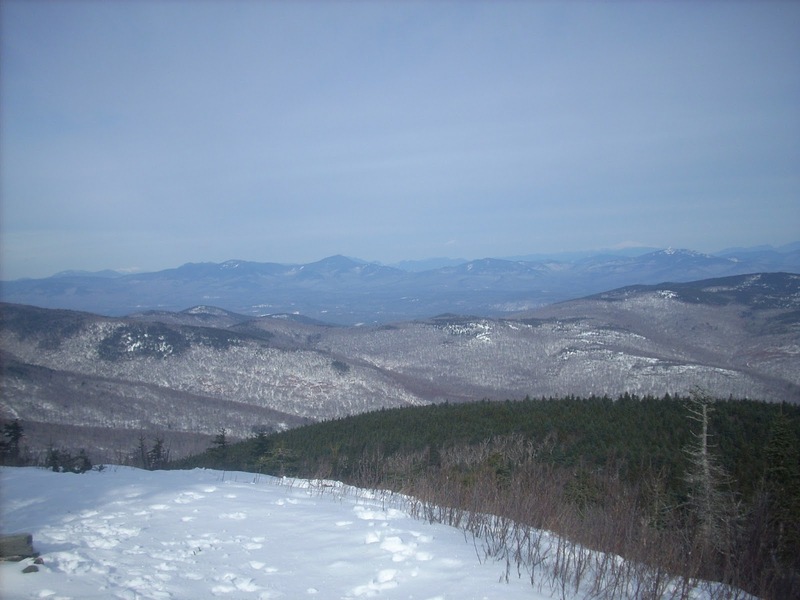 I continued northeast and the snow cover thickened anywhere from 2 to 6 inches as I followed the Turtleback Mountain Carriage Rd along a contour line below Middle Mountain. My 0.2 mile bushwhack along the contour line to the Mt. Shaw Trail was a beneficial decision saving me almost 1 mile of hiking. I would highly recommend making the short side trip to visit the under-rated Black Cap summit before continuing to the highest peak in the region. Mt. Shaw offered spectacular panoramic views. Mt. Shaw (left) and Black Snout Mtn. (right) from the Turtleback Mtn. Summit. Black Snout Mtn. 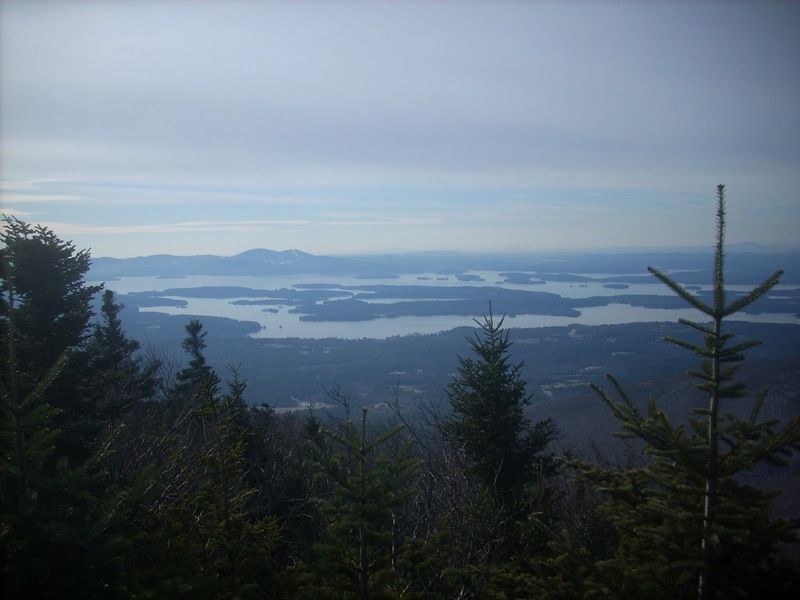 provided impressive views of Lake Winnipesaukee to the South. Looking North from the summit of 2990 Ft. Mt. Shaw. I would love to do this, minus the bushwhacking.